Your an oss agent who's task is to infiltrate a axis factory and kill a ss doctor before he escapes. This is one of the map Gunrock worked a long times ago and decide to finally released it. I'm not sure about the date of release the one mentioned here above is associated with the pk3 file but in the readme there is another date mentioned (23/04/05) if we take in account this one, this is the first release of Briant. 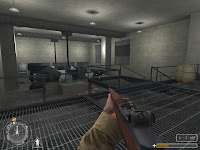 In this map your main objective is to enter a german base to kill an important officer and after to escape. Design is quite good for a first map, it's perhaps a little boxy and static but general architecture and use of environment vehicles is well put together to create a interesting layout, the mix between indoor and outdoor and the use of a tram ride make it even realistic, sadly it misses certainly a good ambiance by not integrating some real action (ambush, conterattack,...) and by using more sounds of a certain german activity in the base. Also several part misses defenetly some attention and especially the sewer part. 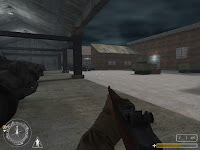 Gameplay is stray forward and quite easy with a little bit more than 10 enemies to kill. Objective are too obvious and the lack of enemies make it a easy walk, the fact that enemies are not always well placed also dicrease the fun factor.